Mutual Funds have become a popular investment tool over the last few years. It should be considered by every investor while deciding their investment portfolio strategy. However, like any other investment tool, mutual funds have their own advantages and disadvantages. Let us discuss these in detail so that you, the investor, has a better idea about the benefits of mutual funds and can make an informed decision. One of the primary benefits of Mutual Funds is its liquidity. Mutual funds are easy to buy and sell unless the scheme you have opted for is a close-ended one. So liquidity is hardly an issue for the investor as they can sell their units quickly if they have urgent money requirement. Similarly, investment can be made at any time when excess money is available. The investor is not bound by fixed investment at regular intervals. However, investors should consider the exit load and pre-exit penalty while selling mutual funds. These charges might be high enough to reconsider selling immediately. Mutual funds invest in various instruments to spread and reduce potential risks. A fund could be investing in the equity market, debt market, money market instruments, etc. This leads to diversification. It protects the fund when one instrument fares badly in terms of returns. Example, if the stock market crashes, the debt markets return will go higher and the fund return on investment will balance out. Thus, it is one of the prime benefits of mutual funds. Investors should read in detail about the investment strategy of a mutual fund before investing in it. Another important benefit of mutual funds are that they cater to the individual. There are various types of mutual funds in the market. They can be investing in the equity market, debt market or money market instruments. They can be open-ended or close-ended. Therefore, there is something for each type of investor. This makes mutual fund the best investment tool and provides something to all investors to suit their financial goals. An investor should consider their own needs and risk appetite and decide on the mutual fund they want to invest in. A mutual fund is managed by a fund house. Each fund house has a fund manager for each mutual fund they provide. It is the responsibility of the fund manager and his team of experts to decide the investment tool in which they will invest the money. They carry out the research and analysis of all investment tools which are eligible for investment as per the fund document and guidelines. Investment in tax saving mutual funds is available for deduction under section 80C of the Income Tax Act. Though taxation on the sale of mutual funds depends on various factors, the rate of tax on equity-oriented mutual funds is 0% to 15%. Over a long duration, most mutual funds have constantly outperformed bank deposits in terms of return on investment. The interest earned on bank deposits is taxed at the investors’ tax slab which can be as high as 30%. Thus investors get a tax deduction as well as the lower tax rate on the return on investment when they invest in mutual funds. Buying mutual funds involves processing fee and other charges. Some of these charges are fixed and others are variable (calculated as a percentage of the investment value). Thus an investor can save on the fixed charges if they buy in bulk in one go. If they invest in multiple stages, the fixed cost will have to be borne each and every time. There are many mutual funds which have zero load and low expense ratios. An investor should compare and factor in these charges of similar mutual funds before investing. Investments in mutual funds can be made as low as Rs. 500/-. Thus, an investor does not need to make a big investment every time they decide to invest money. They can make bigger lump sum investments as and when money is available and keep investing small on a normal basis. Investing in a mutual fund is a quick and painless process. These days it is very easy to identify and pick the mutual fund most suited to an investor. Maintaining the funds does not take much time of an investor. Once you have invested, the fund house or the agent will decide when, where and how much to invest according to the investors’ needs. Many people forget to make investments on time due to forgetfulness. This might lead to various issues depending on the investment tool involved. People are always skeptical of investment tools which are new to them. Giving away their hard earned money is always a difficult task when they do not know the legal aspects of something. In the case of mutual funds, the fund houses are under the constant vigilance of SEBI and AMFI. An investor can check the genuineness of fund houses and asset managers through SEBI. They also have a grievance redressal mechanism for investors who face issues. An investor can plan their investment in a mutual fund based on their current budget and income level. They can either invest systematically through a SIP (systematic investment plan) at fixed intervals or they can make a lump sum investment. The fund house has to incur various expenses while maintaining a mutual fund, mainly the salaries of the fund manager and analysts. All expenses of the mutual fund are included while calculating the expense ratio of a mutual fund. The expense ratio of most mutual funds is around 2%, however, this ratio can go up to 2.25% for some mutual funds. This money comes from the money the investors have put in and a greater expense ratio is no guarantee of a better performing mutual fund. Lock-in periods are periods for which you cannot sell your investment in a mutual fund and if you do sell, the pre-exit charges can be high. Mutual funds with lock-in periods always keep a certain portion of the fund in cash to pay out pre-existing investors. This portion does not earn any returns for the investors and is basically dead money for the duration of the lock-in period. 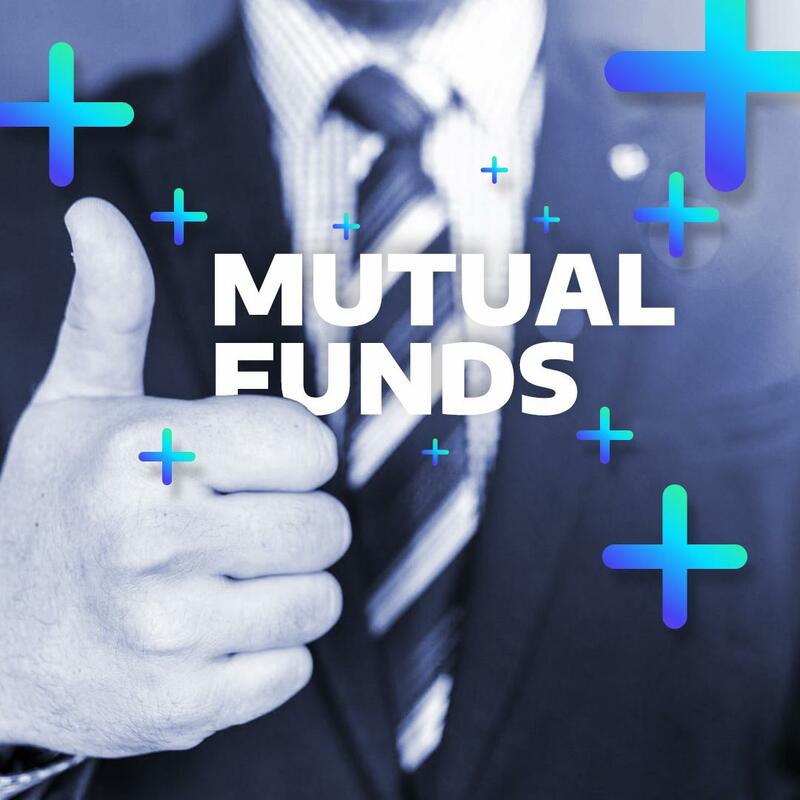 There are many mutual funds with lock-in periods of 5 to 8 years and an investor should consider this very highly before investing in such mutual funds. One of the main advantages of mutual funds is diversification under which the fund manager invests the money of the mutual fund into various instruments. However, this also leads to dilution as diversification leads to averaging out of your return on investment. A mutual fund might make a return of 30% on one investment and a negative return on another. A mutual fund investor is never going to match the return on investment of the best performing stock in the market. Mutual funds are one of the various investment tools available to people, the others being equity, bonds, provident fund, bank deposits, etc. All these options have a different risk factor, a rate of return, lock-in period and costs. An investor should decide the make-up of their personal investment portfolio after considering all the above-listed factors. Along with these factors, the investor should also consider their own financial ability and financial goals. Let us compare mutual funds with the other major investment tools available to get a better idea of where mutual funds stand. While mutual funds can invest their money in equity or debts, a major part of today’s mutual funds invests their money in equity only. People might question that why should an investor not invest directly in the equity market. An important factor that makes mutual fund an attractive option is that experts manage it. An investor has to hardly research before investing in mutual funds in comparison to investing in equity. Once an investor has selected his choices of mutual funds, the fund managers will manage the money on the investor’s behalf. The average rate of return of mutual funds might be equal to equity but what makes the mutual fund more attractive over direct equity is that the risk is spread across various stocks and managed carefully by experts to reduce potential risks. Every person has invested in some kind of provident fund in their life, be it PPF, EPF or VPF. However, the rate of return on these investments is much lower than mutual funds. EPF/VPF have a lock-in of 5 years for tax purpose; while PPF has a fixed lock-in period of 15 years that can affect an investor’s liquidity. Mutual funds outperform provident funds with their greater rate of return and liquidity. Bonds are unsecured investments and can have a lock-in period of 3 to 10 years. Corporate bonds have high risks and should never be invested in without checking their credit rating. Institutional bonds rate of return keeps fluctuation even during the period of investment, i.e. it is affected by market forces. 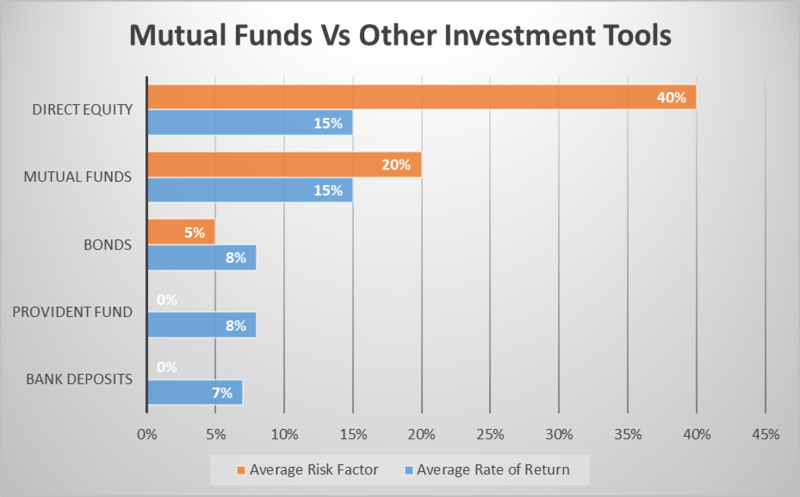 Mutual funds definitely give a better return on investment than bonds. In addition, liquidity is not an issue if the mutual fund is an open-ended one. The returns on bank deposits are only half of that of mutual funds and the investor has to pay tax on those returns at their tax slab rate. That means that if an investor is at the 30% tax bracket, his return on bank deposits will not even cover an inflation rate of 5%. Bank deposits also have a pre-decided lock-in period and pre-mature closure can lead to a penalty on the rate of return. Thus, mutual funds are better in the aspect of the rate of return and liquidity in comparison to bank deposits. 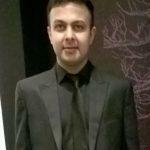 Deepesh Khatri is a Practicing Chartered Accountant based in Pune. He specializes in Direct as well as Indirect Tax Matters. In his free time, he likes to read and play football.